All tests come with detailed instructions, additional testing tips and frequently answered questions which you should carefully familiarise yourself with before beginning testing. For your convenience these can be printed from our Downloads section or viewed online on our Ovulation Test Instruction page. BEST VALUE. The most economical of our testing options available making them ideal for those with lengthy or irregular cycles and for those who find they like to test more than once a day. Patient ID platform ideal for those wishing to record data and results. Ideal for those requiring sample free, fast discrete testing. Can be taken with you and used anywhere. Easy to use option includes dropper for accurate measurement. Simply dip strip in urine sample and read. Simply put 5 drops of urine in the collection well using the disposable dropper provided and read. Simply place absorbent strip in urine stream and read. 99% accurate results in less than 5 minutes. Each strip is individually packaged in a foil pouch with moisture absorbing desiccant for protection. Each cassette and dropper is individually packaged in a foil pouch with moisture absorbing desiccant for protection. Each midstream is individually packaged in a foil pouch with moisture absorbing desiccant for protection. Our Baby4You ovulation tests are imported directly from a Western Biomedical Company with an international reputation for excellence in the development, research and manufacturing of high quality diagnostic tests. As a certified Original Equipment Manufacturer (OEM) of rapid diagnostic tests they have obtained ISO 13485 / ISO 9001 certification, FDA approval and CE Mark. All our ovulation tests are of the highest quality and meet all regulative requirements. By purchasing at manufacturer direct prices we are able provide you with professional quality tests for use in the privacy of your own home at wholesale prices. Woman have Luteinizing Hormone (LH) present throughout their cycles and in woman of reproductive age this level will normally be somewhere are the 5-20 mIU/ml range. When the surge occurs the basal level rises to approximately 50-200 mIU/ml and at this level the process of ovulation will normally be initiated. There are however some exceptions to this included in which is a small proportion of women who have no known fertility issues yet ovulate (as confirmed by scan or 21 day progesterone’s) on very low levels of LH (under 20mlU) at peak. For woman such as this the lower range i.e 10-15mlU ovulation tests are the better option and for this reason we are now offering the higher 10ml/U sensitivity David Ovulation Tests on our website. However please be aware that these tests are not suitable for all groups of woman. For instance woman in the older age group or those with conditions such as PSOC can have resting LH levels at 15mlU and above and hence if they tested their urine they could potentially get a positive reading at all stages of their cycle. In this instance the concerning thing is that in not knowing this they would simply start using them at the recommended time, get a positive straight away and presume it was a sign that they are ovulating, when in fact they may well not be and there is the potential for fertility issues to go unnoticed. It is for this reason that we advice caution in the use of the higher sensitivity tests and recommend that in order to avoid the potential for false positives that the majority of woman and in particular those with diagnosed fertility conditions, in an elder age bracket or with elevated LH hormone remain with the standard 25ml/U testing option. 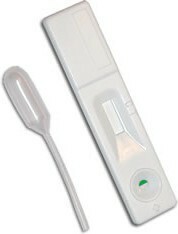 Ovulation tests or Ovulation Predictor Kits (OPKs) work by detecting the level of Luteinising Hormone (LH) in a woman’s urine. Unlike some other methods for predicating ovulation OPKs are useful in that they anticipate when ovulation is about to occur rather than simply confirming that it has already taken place. Throughout the menstrual cycle a small amount of a hormone called Luteinising hormone (LH) is produced. Approximately 24-36 hours before ovulation the body briefly produces a large amount of this hormone. This large release of luteinising hormone is referred to as the 'LH Surge'. The LH surge triggers ovulation, which will typically occur within the next 24-36 hours. Ovulation predictor tests are designed to detect these higher levels of luteinising hormone (>25mIU) which occur during the LH surge. 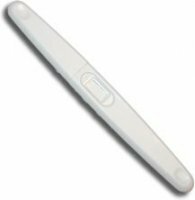 Ovulation predictor tests are quick and easy to use and come in a variety of styles including strips, tiles and midstream. When to begin testing is determined by the length of your cycle. Typically, testing starts three days before your estimated time of ovulation. For example, you should begin testing on Day 11 of your cycle if you have a 28 day menstrual cycle or Day 15 if you have a 32 day cycle. Continue carrying out one test mid-afternoon over the next five days, or until a positive result is obtained. If you are menopausal, taking fertility drugs, oral contraceptions or medicines containing HCG or LH this can affect the test results. Woman with diagnosed hypothyroidism or fertility problems should consult their doctor prior to use. If you have PCOS and elevated LH is one of your symptoms of PCOS then you can get false positives or misleading results. In the event that you have irregular cycles, absence of periods or have been trying to conceive for over six months without success we recommend that you consult with your physician.